The ongoing surge of refugees into Europe from Syria, Afghanistan, Iraq and other war-ravaged countries presents a striking demographic contrast: hundreds of thousands of predominantly young people trying to get into a region where the population is older than in almost any other place on earth. 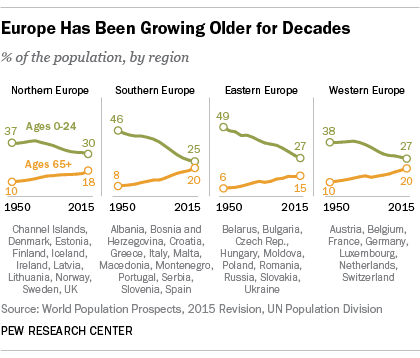 Europe has been graying for decades, primarily because of longer life expectancies and low birthrates (and, in some countries, high levels of emigration by young people of child-bearing age). 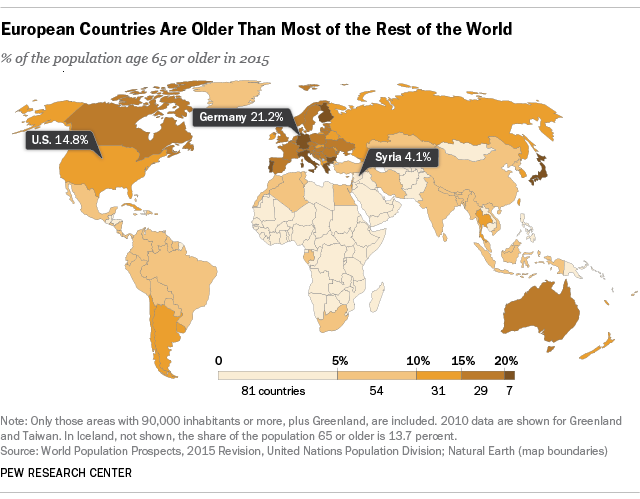 In 1950, according to our analysis of data from the U.N.’s Population Division, 8% of the continent’s population was 65 or older; by 1990 that share had risen to 12.7%, and this year it’s estimated to be 17.6%. Coping with rising numbers of older people, and concomitant declines in working-age people, already is posing considerable social, economic and political challenges in countries such as Germany and Italy, and likely will do so in other societies as they age (including the U.S., where 14.8% of the population now is 65 or older). Previous waves of non-European migration have already altered the culture and demographics of several European countries – think Turks in Germany, North Africans in France, or West Indians and Pakistanis in the United Kingdom. But the current wave of migration into Europe, unprecedented in its sheer scale since the end of World War II, could change the continent’s underlying dynamics. 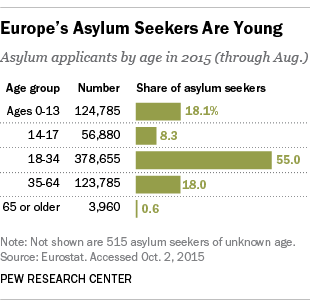 According to data compiled by Eurostat, the European Union’s statistical agency, 81% of the 689,000 people who had formally applied for asylum in EU countries this year (through August) were younger than 35; more than half (55%) were ages 18 to 34. Hundreds of thousands more refugees are expected to arrive before year’s end; one news report states that German authorities expect as many as 1.5 million asylum-seekers in that country this year. But others are skeptical that migration, even on the scale being seen this year, can do much more than dent the long-term aging trend. A 2001 report from the U.N.’s Population Division, for instance, estimated that Germany would need a net total of 17.8 million migrants between 1995 and 2050 (an average of 324,000 per year) to keep its overall population from shrinking; even then, the ratio of working-age people to elderly would still fall.